Russ Anderson Jr’s Fly Girl returns in her sixth digital single adventure as a part of Anderson’s Pro Se Single Shot Signature Series! Find out what happens when the evil to face is The Monster Inside of Me! Sergio Gutierrez is an athlete at Ocotillo High School, who was hospitalized in the very first battle between Fly Girl and the Trickster. With an injury that puts him out of commission for the rest of the football season, he returns to school to find himself surrounded by sympathetic classmates and facing an uncertain future. The Trickster knows just what to do with Sergio, though. He’s going to harness the resentment and pain that Sergio feels, and use him as the latest—and perhaps final—weapon in his campaign against Fly Girl. But when the Trickster uses his power to unleash the beast inside of Sergio, he may find that he has created a creature that is impossible to control! 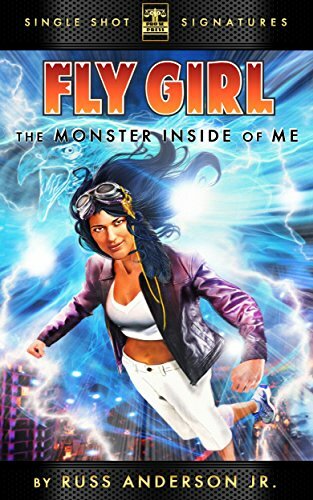 The Monster Inside of Me is the sixth short story in the Fly Girl series by Russ Anderson, Jr. A Pro Se Single Shots Signature Series from Pro Se Productions.